I'd like to share a little anecdote that happened in the office the other day. Young Kristin, the editor of our trivia publication, was having trouble with her computer. So she called Wes, the computer guy, over to her desk. Wes clicked a couple buttons and solved the problem. As he was walking away Kristin called after him, "So, what was wrong?" And he replied, "It was an ID ten T error." A puzzled expression ran riot over Kristin's face. "An ID ten T error?" What's that in case I need to fix it again?" He gave her a grin. "Haven't you ever seen an ID ten T error before?" "No." "Write it down," he said, "and I think you'll figure it out." 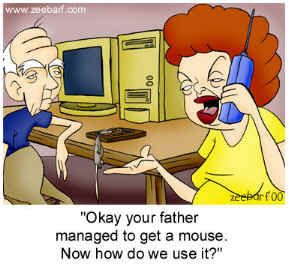 I found these wonderful jokes at www.glasbergen.com... check it out!